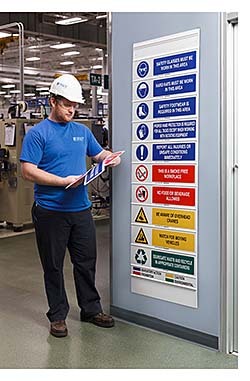 The boards can hold up to 11 interchangeable signs to keep facility employees and visitors aware of relevant safety information. The sign inserts are available with 80 stock messages and are customizable with unique messaging, artwork, and language options. The display boards can hold four, six, or eleven sign inserts and are available in four sizes, both in wall-hanging or three-sided, free-standing versions. The boards are made of plastic or aluminum material.